The Holy Antiochian Synod assembled between the 17th and 20th of June 2013 in the first ordinary session presided over by His Beatitude John X and attended by Their Eminences the Metropolitans George (Mount Lebanon and its dependencies), Elia (Hama and dependencies), Elias (Saida, Tyre and dependencies), Anthony (Mexico, Venezuela and dependencies), Sergios (Chile), Damaskinos (Brazil and dependencies), Saba (Hauran and Arabia), Boulos (Australia), George (Homs and dependencies), Silouan (Argentina), Basilios (Arkadias and dependencies), Efrem (Tripoli, Koura and dependencies). Apologies for the absence were received from their Eminences Spiridon (Zahle and dependencies), Philip (New York and North America), Constantine (Bagdad, Kuwait and dependencies), Youhanna (Lattakia and dependencies), Elias (Beirut and dependencies) and Metroplitan Paul (Aleppo, Alexandretta and dependencies, who though absent on account of his captivity, attended in spirit through the prayers of the fathers of the Synod and their supplications. Archbishop Joseph (Zehlaoui), bishops Ghattas (Hazim) and Efrem (Malouli) participated in addition to the registrar of the Synod, Economos George Dimas. The Synod started the session with a Trisagion for the repose in peace of Patriarch Ignatius IV of blessed memory. Patriarch John X presided and the metropolitans present participated in the service offered in the church of the Balamand Monastery. His Beatitude then commenced the synodical session with the prayer and the invocation of the Holy Spirit in order to inspire the fathers of the Antiochian Church to serve the will of God and edify His people. There then followed a minute’s silence for the repose in peace of the soul of Patriarch Ignatius IV, of blessed memory, who led the Antiochian Church for 33 years exercising pastoral care and doing his best to conserve it united and stable in the mother countries and abroad. The fathers of the Synod implored God Almightly to keep their Eminences the Metropolitans Paul Yazigi, Greek Orthodox Metropolitan of Aleppo and Alexandretta, and Youhanna Ebrahim, Syriac-Orthodox Metropolitan of Aleppo. They asked God to strengthen them in their captivity and grant them together with the two kidnapped priests and all other abductees a good and safe return to their spiritual children in the Archdiocese of Aleppo. At the beginning of this first synodical session under his leadership, His Beatitude John X renewed his gratitude to the fathers of the Synod who had granted him their trust and asking always for their prayers, and through them the prayers of all the spiritual sons of the Holy Antiochian see. Then, the Patriarch delivered a speech in which he explained his perspective for the future of the Church’s work and all the necessary measures to achieve this effectively. He talked about the challenges and difficulties which might face our people and Church in today’s world. He highlighted the essential responses for a time in which sorrowful and painful events were taking place, generating evil consequences, namely the kidnapping, killing and destruction of the sons of the Church. He emphasized the necessity of exercising pastoral care in an appropriate manner, strengthening the capacities of the Church to serve the faithful, caring for all aspects of their lives and circumstances and acting to help to remove the injustices which might yet still face them. His Beatitude also underlined the necessity of maintaining a spirit of permanent renewal including finding modern means of media access and communications using new technologies in order to improve the service of our people and strengthen the presence of our Antiochian Church wherever she may be found. The Synod endorsed these goals by considering a paper of pastoral work presented by the Patriarch as a guide to the general pastoral plan for the Antiochian See in the forthcoming years. The fathers of the Synod discussed also a paper proposed by His Beatitude showing a detailed organizational diagram for the work of the commissions of the Holy Synod and also the patriarchal departments. The fathers agreed on the directions included in this paper considering them essential for the development of the work of the Synod in promoting the participation of the archdioceses and strengthening the role of faithful in the life of the Church. The Synod then listened to the reports presented by the archdioceses. These reports included a description of the pastoral situation in all archdioceses, that is to say, the number of the parishes and priests, the institutions involved, the projects to be accomplished and the difficulties which hinder the work. The fathers also highlighted the necessity of cooperation and collaboration between the archdioceses as an expression of Antiochian unity. 1. Support the Department of Development working in the Patriarchate in the field of relief and development. The Synod appreciates its efforts and the way in which it works which has led it to obtaining an international award from the UN and respect from many others in the field. The Synod drew up plans for expanding the field of work covered by the department, so that it might include, in addition to those already served without discrimination, all our children suffering various difficulties in the whole territory of the Antiochian See. 2. Establish a media centre named “the Antiochian Media Centre” which would always be up to date in the necessity of presenting a speedy and effective response when communication the Good News (the Gospel) and the news of the Patriarchate using contemporary language to the world. 3. Construct a “pastoral database” the aim of which would be to gather all possible information about Orthodox resources which facilitate communications between the faithful, so that their energies might be used to serve the Church and society according to their talents and technical capabilities. 4. The Synod declared Sunday the 15th September 2013 as a day of Antiochian Solidarity in the support of philanthropic work of the Holy See. The Synod invited all Antiochians in the mother countries and outside to contribute generously as an expression of their love for the little ones of Christ who need help. The Synod elected His Grace Efrem Malouli (Bishop of Seleucia) as Patriarchal Vicar, and nominated him as a secretary of the Holy Synod and chief of the Secretariat of the same. The Synod thanked His Grace bishop Ghattas (Bishop of Cara), the previous patriarchal vicar, for his service during the last years. The father of the Synod studied also the crisis in connection with the Patriarchate of Jerusalem. The Antiochian attitude was perfectly clear. 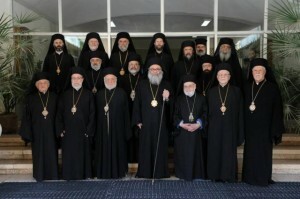 The Synod was aware of the correspondence between the two patriarchates. His Beatitude then explained recent developments in the light of his meeting with His Holiness, the Ecumenical Patriarch Bartholomew during his recent visit to Istanbul. 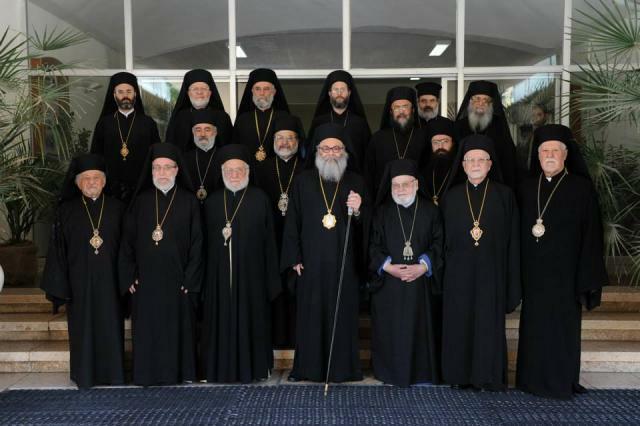 The Synod decided to accept the initiative of the Ecumenical Patriarchate in having a three-way meeting between Antiochian and the Jerusalem Patriarchates in the presence of the Ecumenical Patriarchate. The fathers also affirmed their refusal to adopt violence as a way of dealing in political affairs, especially in Syria, Lebanon and Iraq and every country in Antiochian territory and elsewhere in the world. They re-emphasized their refusal that religion should be used to divide citizens of the same country, inviting all those responsible within all religions to proclaim that God does not accept that man should be oppressed or damaged for any reason, and they demanded an end to bloodshed caused by the political use of religion. The fathers of the Synod invited the international society to work together to limit the use of weapons and highlight the importance of dialogue. They pronounced an appeal to encourage those of good will to play a concrete role in building the bridges between the compatriots and work hard to establish the sense of citizenship and responsibility in order to put an end to the violence and promote human and economic development. The Holy Synod declared its repudiation of attacks on human beings, whoever they are, by means of kidnapping, torture and killing. The image of man must be respected and upheld. The Holy Synod appealed for the release of all those kidnapped, especially the Metropolitans Paul and John, and priests and all the kidnapped. The Holy Synod addressed their Children in Aleppo, suffering for the absence of their pastors, covering them with paternal care and asserting that they are doing their best for the release of the Metropolitans and all those in captivity. The Patriarch assured that he was ready to serve them and to grant them all the support requested especially during the difficult circumstances through which their city is passing. The Holy Synod underlined the necessity of making peace in beloved Syria through the dialogue and political solutions, so that Syria might return to a spring of coexistence and an expression of the cultural heritage which it has always carried. The Synod also invited that the dear Lebanon keep its special characteristic of variety and diversity, so that the constitutional vacuum might not be a reason for insecurity and the lack of a settlement. The Holy Synod considered that the injustice caused to Palestine during 60 years is unacceptable. The Synod affirmed that the international and regional efforts should be continued, so that this land returns to a land in which all good things and people from all over the world might meet together. The fathers asserted that the Holy Antiochian Synod should refuse the logic of “thinking as a minority” insisted on by some Christians. Christians are constituent parts of this East and in this they keep firmly their eastern identity. They do not need protection in order to build with their partners in citizenship the future of their countries and their peoples. The Holy Synod studied some other recent matters, including the subject of the assembly of bishops in our churches abroad. The Holy Antiochian Synod concluded the session praying to God to keep His Church, clergy and people, in the mother countries and outside, to overshadow her with His blessings.